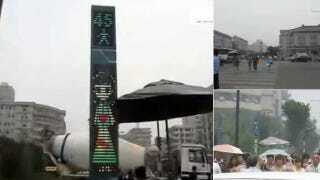 The city of Xi'an in China has a new crosswalk signal. And neighboring Japan points out the obvious: this is way too cute for a traffic light. In China, the anime-style character on the sign, people in Japan speculate, is probably aimed at children. This traffic signal uses a young LED anime-style girl to preside over a busy intersection by counting off the seconds before the light changes. That's helpful.